Plot: OH BARNACLES! 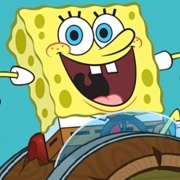 ITS THE BIKINI BOTTOM GRAND PRIX One of the greatest events ever to hit Bikini Bottom is about to take place - Are you ready for the seaweed squishing, barnacle popping adrenalin ride that is Spongebob Kart?! You are?! Great! Join Spongebob Squarepants, Patrick Star, Squidward Tentacles and Gary the Snail as you aim to become the Bikini Bottom Karting champion but watch out the evil Plankton and The Flying Dutchman will be hot on your tail!